Monastery of the Glorious Ascension (The Chaplain's Corner): "On Earth, As It Is In Heaven..."
There was once a priest who did not want to serve the liturgy because it was a cold winter day. The temperature was 10 degrees below zero and the priest knew that the only person who was likely to come to the service was the chanter. The priest had no idea about the Church’s teaching on the presence of the Triumphant Church and how the Divine Liturgy benefits the living and the departed. With difficulty he forced himself to go to church. On the way to church he kept wishing that the chanter would not come so that he would not have to serve and go home. However, the chanter did come. The priest did the Prothesis (or Proskomedia, the service of preparing the holy gifts) in a hurry and began the Divine Liturgy. Shortly after, some bishops, priests, monks and nuns and some lay people arrived. Most of them sat in the choir section and began to chant so beautifully that the priest forgot about how cold and lonely he was earlier. His whole body was warm and his whole being was all a flame…. When he did the small entrance he noticed that the church was full of people – most of them familiar – he did not pay much attention and just continued with the Divine Liturgy. When the time came for the Sanctification of the Holy Gifts he saw three bishops, brightly clothed and radiant entering the Holy Altar. They knelt with him and prayed. The priest then stood up very carefully with fear, took the censer and in a loud voice said, ‘Especially our All Holy, Immaculate, Most Blessed and glorious Lady Theotokos and Ever-Virgin Mary…’. The soul of the priest was amazed and filled with divine joy. Peace and heavenly stillness, hesychia, dominated his inner self. When the time came for the elevation and dividing of the Host (Lamb) the whole church filled with the sweetest melodies. The whole multitude of people who were present along with the monks, priests and bishops chanted not only once but many times, ‘One is Holy, One is Lord: Jesus Christ, to the glory of God the Father. Amen’. Next they chanted the Holy Communion hymn, ‘Taste and see that the Lord is good, Alleluia.’ The priest was wondering what to do. Should he partake of the Holy Communion first or step aside for the three bishops who were present. Just as he was thinking this, one of the bishops nodded to him indicating that he should receive Holy Communion and then to Unify and Place the remaining of the portions of the Lamb into the Chalice along with the portions in memory of the Holy Theotokos and the Saints. 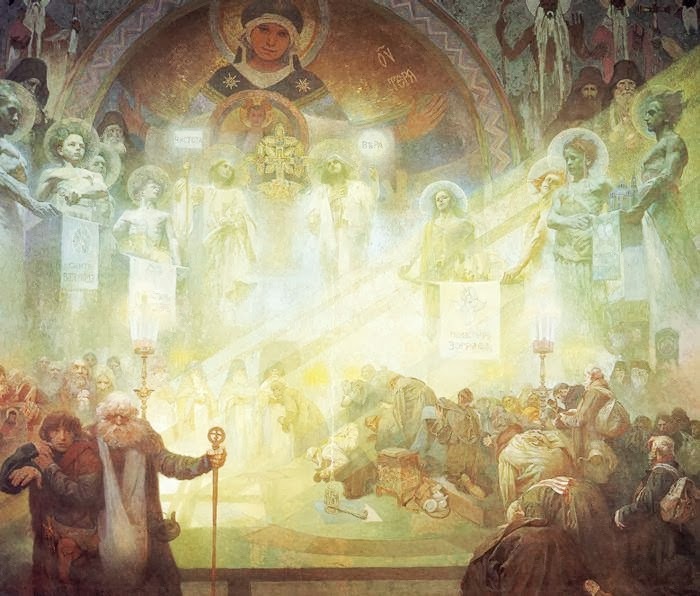 Having completed this the priest then opened the Beautiful Gate … and saw no one in the Church… he turned and looked back into the holy altar, he looked to the right, looked to the left, the bishops had disappeared, he stood there speechless, amazed. He slowly opened his mouth and chanted the next petition, ‘With the fear of God and faith and love, draw near …,’ and the chanter slowly drew near to take Holy Communion. The priest was still amazed, still wondering! The whole Triumphant Church was present. All those present in the church were persons familiar to him, they were persons that had departed from this life and he would from time to time commemorate their names during each liturgy: ‘that’s why they were present, that’s why they all seemed so familiar’, he thought. As for the bishops in the altar they were the Three Hierarchs: Saint John Chrysostom, Saint Basil the Great and Saint Gregory the Theologian. So many years of study at university, so much research and so many sleepless nights he spent studying and these efforts were not able to give him not even one drop of the sweetness and divine knowledge that this one Divine Liturgy gave him.